Used in the field of osteoporosis, TBS iNsight™ (Osteo) is an advanced imaging software application for bone densitometers (DXA). It provides doctors with a simple solution to better predict a patient’s risk for bone fracture; to fine-tune therapy decision; and to improve patient management. As you may know, osteoporosis is a common disease characterised by low [cortical and/or trabecular] bone density and microarchitectural deterioration of bone tissue. Its consequences are an increase in bone fragility leading to an increased risk for fractures, especially of the hip, spine and wrist; and possibly leading to fractures themselves. Medimaps developed TBS iNsight™ (Osteo) to assess the microarchitectural deterioration of bone tissue – the second main characteristic of osteoporosis. It computes a Trabecular Bone Score™ (TBS), which provides extremely useful additional clinical information as to the microarchitecture of the bone. Easily installed on a DXA machine, this software application uses the DXA 2-D images produced during a regular spine Bone Mineral Density (BMD) scan to seamlessly compute a patient’s Trabecular Bone Score within seconds. This result provides precious information as to the patient’s trabecular bone microarchitecture and is displayed in a “TBS report”, automatically edited and easy to interpret by practitioners. 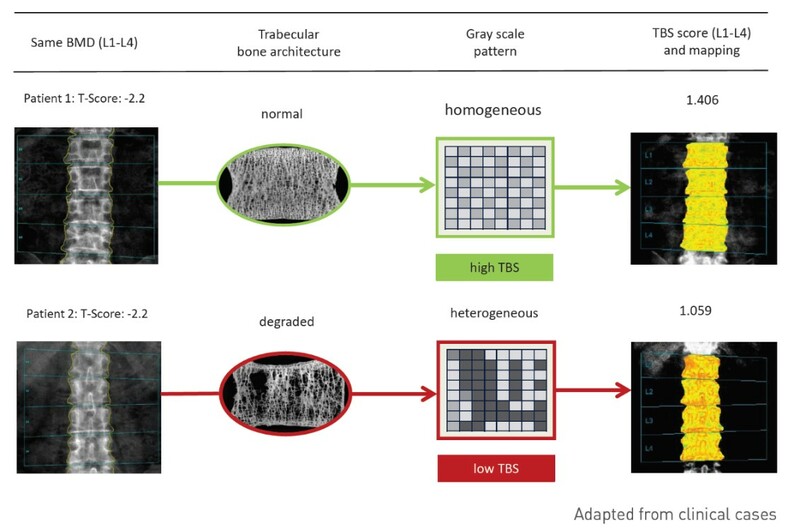 Two patients with the same trabecular and/or cortical bone density (same BMD values) can have a different underlying bone microarchitecture (different TBS scores). compatible with 80% of all installed DXA machines. provided for use as a complement to a DXA analysis. TBS report available in 14 languages. TBS has gained international recognition with 500 peer-reviewed publications. It has been incorporated in several international and national guidelines and recommendations. With this positive track record, TBS has become the gold standard for bone microarchitecture assessment in daily clinical routine. The combination of TBS®, BMD and clinical risk factors or FRAX® is a must-have solution to get a more comprehensive overview of a patient’s bone health. It improves fracture risk prediction, helps identify more patients at risk and fine-tune therapy decision. Some statements on this website may not have been validated by the US FDA. If you are from the US, please contact us at support@medimapsgroup.com to know more.